With the low temperature, reduced physical activity, shorter days and a lack of sunlight, it may come as no surprise that the winter months prove to be the most miserable time of the year for individuals with mild to moderate depression. Seasonal Affective Disorder, more commonly referred to as winter depression, is a type of mood disorder linked to the lack of, and sensitivity to light. Scientists who have studied winter depression have taken into consideration many variables that could possibly have an effect on mood during the cold winter months such as the “fall back” in time experienced during Daylight Savings Time and chemicals in the brain. According to a study from Harvard Medical School on Seasonal Affective Disorder (SAD), nearly half a million Americans suffer from the winter blues, experiencing such symptoms as loss of pleasure and energy, followed by the unstoppable impulse to delve into sweets and treats that are dangerous to heart health. For some, visits from family and friends and celebrations of the New Year may be enough to kick the mood swing for a short time, but for others, this may be the very onset of the winter blues. 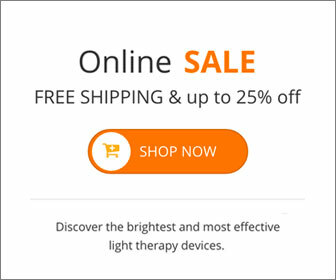 Traditional light therapy has been shown to reduce the effects of seasonal depression though studies are inconsistent based on variables such as dosage, age, gender and timing. Depression typically leads to a lack of sleep, a direct correlation to disruptions to the circadian rhythm—a 24 hour cycle that dictates the processes of the psyche in all living things. The use of artificial light from special light bulbs is a cheaper alternative to expensive drugs with potentially dangerous side effects to treat mild to moderate depression. Light bulbs and energy lamps can be purchased at a variety of price options to promote health and well-being, alertness and an enhanced mood. Boost serotonin and dopamine with certain foods to fight depression. Fighting off mild depression can be as simple as being mindful of your everyday diet. According to Livestrong.com, a diet rich in complex carbs, vitamin b, omega-3s and tyrosine will get you through the bitter cold days of winter. When attempting to follow a diet to keep you from feeling blue, refer back to the food pyramid. Make sure to stay on top of your health and be mindful of changes in mood or behavior. Article from the Long Island Heart Associates. This entry was posted on Friday, December 28th, 2012 at 9:31 am	and is filed under SAD. You can follow any responses to this entry through the RSS 2.0 feed.